Ghost stories should always begin as this one does, in shadows so deep that the flickering light of the dying fire barely illuminates the apprehensive faces of the listeners. They should be told in an old man's voice, dry as dust. They should be listened to by other men who are so old and so rich that we can only guess at the horrors they have seen. And, of course, ghost stories should be about things that happened long ago to young, passionate lovers who committed unspeakable crimes and have had to live forever after with the knowledge of them. If at all possible, some of the characters should be living in this life, filled with guilt, while others should be living the half-lives of the Undead, filled with hatred and revenge. Peter Straub's best-selling novel Ghost Story contained all of those elements, and so I plugged away at it for what must have been hundreds of pages before his unspeakable prose finally got to me. At least, he knows how to make a good story, if not how to tell it, and that is one way in which the book and the movie of “Ghost Story” differ. The movie is told with style. 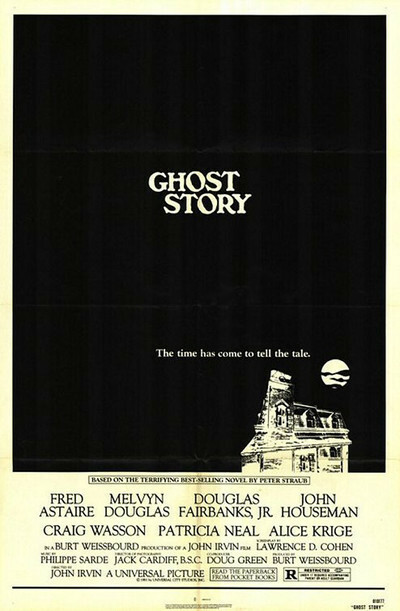 It goes without saying that style is the most important single element in every ghost story, since without it even the most ominous events disintegrate into silliness. And “Ghost Story,” perhaps aware that if characters talk too much they disperse the tension, adopts a very economical story-telling approach. Dialogue comes in short, straightforward sentences. Background is provided without being allowed to distract from the main event. The characters are established with quick, subtle strokes. This is a good movie. The story involves four very old men, who have formed a club to tell each other ghost stories. The casting is crucial here, and the movie's glory is in the performances and presences of Fred Astaire, the late Melvyn Douglas, Douglas Fairbanks, Jr., and John Houseman. What a crowd. There is also a young protagonist (Craig Wasson), who has a dual role as Fairbanks's twin sons. When one comes to a dreadful end, the other begins to suspect that a mysterious woman may have something to do with it. And indeed she may. I would not dream of even hinting at exactly what connection this young woman (played with creepy charm by Alice Krige) might have with the four old men, but of course there is a connection. The movie flashes back fifty or sixty years to establish the connection, but its scariest scenes are in the present. They involve a wonderful haunted house, a long-drowned auto, a series of horrendous accidents, a group of ghostly manifestations, and a truly horrible vengeance wreaked upon the living by the not-exactly-dead. If you like ghost stories, you will appreciate that they cannot be told with all sorts of ridiculous skeletons leaping out of closets, as in Abbott and Costello. They must be told largely in terms of fearful and nostalgic memory, since (by definition) a ghost is a ghost because of something that once happened that shouldn't have happened. “Ghost Story” understands that, and restrains its performers so that the horror of the ghost is hardly more transparent than they are.